On Monday, the WNBA held its annual draft, with Stanford star Nnemkadi Ogwumike going first-overall to the Los Angeles Sparks. While the WNBA Draft will never have the profile of its NBA counterpart, it's still an important time for these franchises and the young women who join them. Their careers begin to take shape, and the teams hope they've selected long-term answers. In most cases, though, they won't find out how they've done for several seasons. The 6-foot-4 French national player wasn't eligible to be drafted because she's too old. League rules stipulate that international players can only be drafted in the year in which they turn 20. Yacoubou turns 26 on Saturday. Atlanta still could try and sign her as a free agent. You might remember that, in last June's NBA Draft, the Minnesota Timberwolves selected Qatar international forward Tanguy Ngombo even though he was 26 (and therefore ineligible) instead of the presumed 21 years old. In that case, though, there were differing reports as to Ngombo's real age and very little was known about the player. Yacoubou has a much more established career and the WNBA's rules are much stricter. For some reason, the Dream neglected to do some very basic research here. The good news is that they can still sign Yacoubou, and the interest they showed in the draft should mean something. 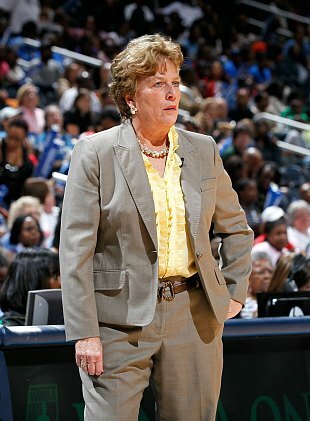 Oddly enough, this isn't the first time a WNBA team has chosen an ineligible player. In 2007, the Sacramento Monarchs (now defunct) picked Meg Bulger of West Virginia in the third round, only to find out that Bulger still had a year of collegiate eligibility and wouldn't be heading to the pros just yet. The league gave them a compensatory pick in the next season's draft, though, so things weren't all bad. If that incident acts as precedent, then Atlanta might make out just fine. UPDATE: According to Kevin Pelton of Basketball Prospectus, the Bulger incident led to the WNBA putting the onus on teams to determine which players were eligible. So it looks like Atlanta will not receive compensation for their mistake.